Out of retirement and back in the fold, Jay Cutler’s first run out for the Miami Dolphins will have fans hopeful for the prospect of new season success! Postponing his proposed analyst career with Fox Sport in favour of one more throw of the NFL dice, following a desperate appeal from offensive coordinator Adam Gase, Cutler kicked off his Dolphins career against the Baltimore Ravens last week. Cutler and Gase had previously worked together back in 2015 at the Chicago Bears and formed a strong relationship, both on and off the field. So following the crushing news that first string quarterback Ryan Tannehill’s knee injury would put him out for the season, 35-year-Old Cutler stepped in and saved the Dolphin fans from despair and it appeared last night in that his partnership with Gase has the potential to be fruitful once again. Despite very much being in the autumn of his career, Cutler proved that he is up to the challenge and seemed in good stead for the start of the season. 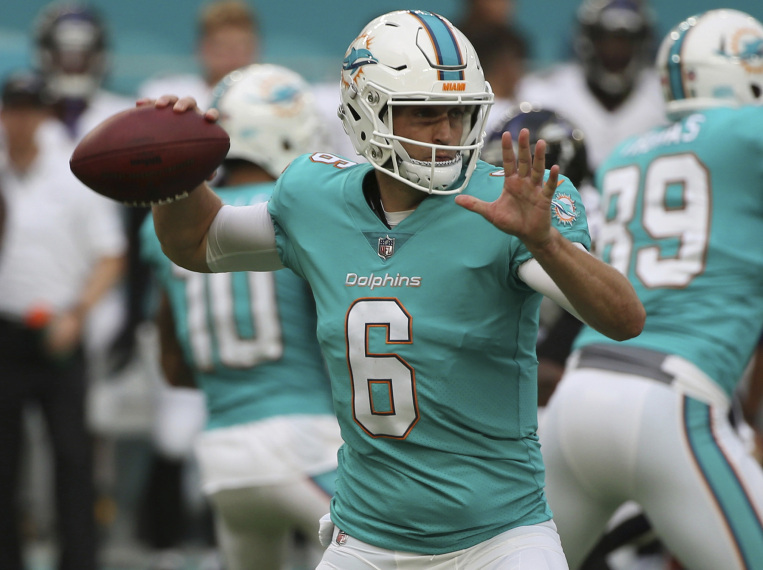 He was comfortable and confident handling the ball and delivered 3 out of 6 passes over 24 yards, and despite the Dolphins suffering a 31-7 defeat, Cutler seemed completely in control of the offense throughout the game. Obviously, a defeat is not what any fans want for their fans this close to the start of season, but if this game was anything to go by Cutler could be the difference for the Dolphins offense this year. Atleast, this is what Dolphins fans will be hoping for, and that they will not be missing Tannehill too much as the season unfolds. If Gase’s comments are anything to go by, this will indeed be the case. Speaking about Cutler’s settling in at Miami, he said, “I think Jay’s comfortable here. He and I are comfortable together. I have always judged people by how they are around me. And in our time together, he’s been really good”. So from the outset this Gase and Cutler reunion could be a match made in heaven, but the woe from the Tannehills absence is not yet forgotten and will not be for some time. No doubt Dolphins fan will still be looking for something more from their team in their next game against the Philadelphia Eagles tomorrow. Of course, it is good to get the kinks out in pre-season, but with only two games left go before the start of the season, time is running out and it is yet to be seen how the partnership of Cutler and his receivers, Jarvis Landry and Kenny Stills, will develop. The pressure is on now for Gase and Cutler alike to make good on the hype surrounding his return, and whether or not it will be enough to keep the Dolphins fans appeased is yet to be seen. This being said, this isn’t Cutler’s first rodeo and he possesses both experience and professionalism in abundance, which are of course, crucial qualities to Quarterback’s performance, especially for one under such huge pressure. So for now, everyone in the Dolphins camp will just be hoping that this shines through, his performance doesn’t wane and that in his last season before he hangs up his boots, Cutler will make it one to remember.